Deep burgundy with a pillowy layer of foam that holds its form throughout. Rick and aromatic with hints of anise, fresh apricot, and honey. On the tongue it offers caramel, fig, and currant flavors with a luscious mouthfeel. Finishes with a pleasant warmness. Whoa… I wasn’t even done pouring this before I had to stop and smell it. It smells AMAZING! I don’t even want to drink it, just smell it. I wouldn’t be surprised if you can smell right now… as you read this. From the looks of the bottle, you would think this beer comes from somewhere overseas. Granted, this is based on a Belgian recipe, but is brewed right here in New York City. It’s actually brewed in Cooperstown. I have been to Cooperstown, but was too young to remember this brewery being there. I am sure we drove right past it. The bottle warns you to pour slow not to disrupt the sediment at the bottom of the bottle. Speaking of the bottle, it’s HUGE! What’s with all these beers being in these large bottles? Who cares… it’s 8.5% ABV so I’m not complaining. The beer, once poured (slowly remember) has a nice thick head. It’s also appears to be somewhat thick in the glass. 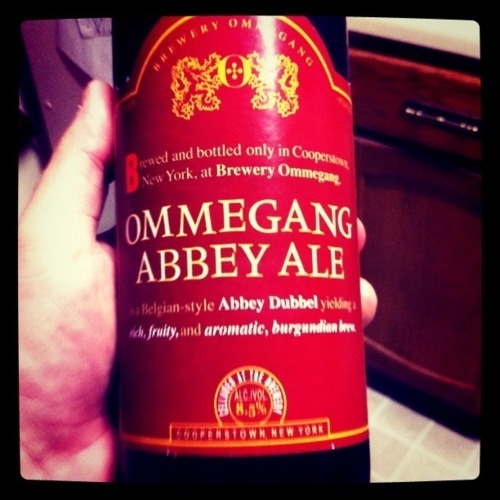 Let’s see what this Abbey Ale tastes like. The aftertaste on this beer is incredible. I have never sampled a drink (beer or other) that has done so much along the way. The smells are intense, filled with those spices everyone talks about. Then the initial flavors… it just gets better and better. This beer is incredible! If you like beer, any kind of beer… grab a bottle of this. Bottoms up people, this beer is good. The Abbey Ale pours out extremely thick. I picked it up and couldn’t see through the liquid in the glass. Wow, what an ale! I don’t think I’ve ever seen one that thick before. It’s almost a burnt orange color of brown (yes, I know – how can a brown be orange, right?) and had a pretty big head when Ricky poured it out into the glasses. The only thing I can think of to describe the smell when you get a whiff of it is that it smells a bit fruity. Let’s see what it tastes like. Hmm, powerful. Wow. It’s a very spicy, hoppy beer. Strange as it may sound, this seems almost to me like it is the orange juice of beers… fruity, thick… it is anything but your everyday ale. I’ve only taken a few sips, so I haven’t gotten the full effect quite yet, but I’m imagining I will even feel full after finishing off this beer. Tastes good, but not your everyday drinking beer. Again, another one of those I’d buy again, but probably only for a special occasion.